Google’s release of their new Nexus 7 tablet several weeks ago is a break from their standard practice, signalling their frustration with manufacturer partners in the Open Handset Alliance who have not managed to dent the market share of Apple’s iPad in any significant way. Let’s get one thing clear at the very beginning, this is not an iPad killer. It can’t even really be compared directly to the iPad, they have different sizes, operating systems and are priced to attract different segments of the tablet buying market. During the last few years Google has released several smartphones under the “Nexus” brandname, signifying that these devices have the latest version of Android installed on them, will get new Android updates first and are developer friendly. However this new Google Nexus 7 tablet is aimed at developers and the general public as well. The Google Play Store is featured heavily in the default homescreen widgets in order to try and convince people to rent movies, buy apps and eBooks. The name is also interesting. Fans of the cult classic movie Bladerunner will know that several rogue Nexus 6 replicants are hunted down and terminated by Dekard, who himself may be a next generation Nexus 7 replicant. Is Google signalling its intentions to kill off all the 7 inch Android tablets in the market which are either poor quality or quite expensive? If purchasing the Nexus 7 via the Google Play Store, the cost including shipping via Fedex for the base 8GB version is $268.99 and the 16GB $319. Plenty of Australian retailers also sell the Nexus 7, but only the 16GB version for $319 and so far stock has run out on some days due to greater than expected demand. Prices for the Nexus 7 in the USA are $199 and $249 plus shipping respectively so it may look like the Australian pricing is unfair. However note that our prices includes 10% GST whereas the American prices have state sales taxes added to them at checkout so the difference is marginal. The Nexus 7 offers a lot of bang for your buck: quad core Tegra 3 processor with 12 core GPU, 1GB RAM, 7” IPS 1280×800 screen protected by scratch resistant glass, 1.2MP front-facing camera, speaker at the back, 8/16GB storage onboard, 4325 mAh battery that lasts over a day as long as you’re not playing videos/gaming all the time, Connectivity via WiFi b/g/n or Bluetooth 4.0, a standard microusb charger/data transfer port, microphone and various sensors including NFC, Accelerometer, GPS, Magnetometer and Gyroscope. At 340 grams the Nexus 7 is a similar width but higher and weighs almost twice as much as a Kobo Touch eInk ereader. Compared to the iPad 3 it is half the weight which is matched by offering half the surface area. The back cover is covered with a series of little indentation bumps which help you to keep your grip easily. To get the price point down to an affordable level Google has made the Nexus 7 WiFi only and they’ve also not included a SD card slot to expand storage in order to encourage you to buy the 16GB model and force use of the cloud for storing any files that don’t fit on board. I think this is overly restrictive because there are times when you don’t have WiFi access for quite some time eg: long flights and you need to store video files to watch locally. Another reason is because Android games can be quite big if they have lots of graphics files eg: the racing game Asphalt 7 uses up 1.38GB just by itself, which is about 10% of the Nexus 7’s usable storage space. Australian Android fan Neil Phillips told me that he used the Nexus Root Toolkit by Wugfresh to “root” (gain full administrator access) to his Nexus 7. After doing that (at your own risk) you can access files on a USB flash drive connected to your Nexus 7 via a USB OTG cable by installing the Stickmount app. just rooted my Nexus 7 using the brilliant Root Toolkit from @wugfresh – thanks again! Google says that it’s possible to connect a keyboard, mouse, or even a joystick or other game controller device to a Nexus 7 tablet via USB or Bluetooth and use it just as you would on a computer, providing that special drivers are not required. The fastest way to understand how to best use it is to read the Nexus 7 Guidebook. Not surprisingly the guidebook can be downloaded for free from the books part of the Google Play Store. If you’re not the kind of person who likes reading there’s a Youtube channel dedicated to introducing users to the Nexus 7, such as this video explaining Jellybean. I’m not a huge fan of Jellybeans as a lolly but the new Android 4.1 version Jellybean is impressive. Google’s codename Project Butter has resulted in noticeable improvements to the general operating system speed, visual effects, touch responsiveness and switching between different apps. Each item in the notification bar like calendar items now has more details and the can be pinch zoomed to find out more or side swiped to be removed from the notification list. One annoying thing Google has done is to make the home screens fixed in portrait view even if you’re holding the tablet sideways. Thankfully you can override that by installing the Ultimate Rotation Control app. One unique new feature that will polarise users is Google Now, which uses data you have given permission to Google to analyse from your web searches, calendar events, location searches on Google Maps etc as well as how long the tablet spends at different locations to determine with surprising accuracy which locations are your home/work. These data points are used for different kinds of predictions eg: warning you with a notification about when to leave and what public transport/driving options you should take to get to a calendar event in time. Note that Google has only been provided with public transport maps and timing information for Sydney, Canberra and Adelaide. Since the Nexus 7 is WiFi only it needs a fixed WiFi hotspot to work at home or your office and a mobile WiFi hotspot to work while outside. For most people this will mean using their smartphone as a temporary WiFi hotspot. However two key Nexus 7 features work without WiFi access. Voice dictation can work offline if you go into “Settings”, “Language & Input”, press the settings button to the right of “Google voice typing”, click on “download offline speech recognition” and choose the language/s you want to use for offline speech to text translation. 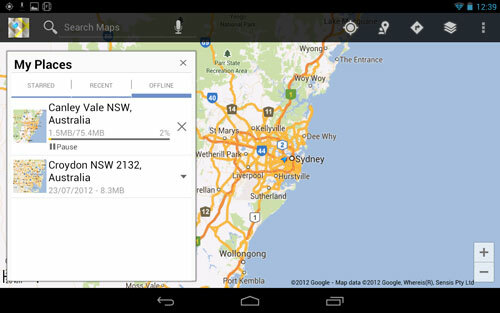 Similarly the Nexus 7 can be used as a GPS map device without needing a data connection if you pre-cache the map details covering the area you’re travelling within. Open Google Maps, choose “Make available offline” from the menu at top right, then pinch and zoom out with your fingers to select a large area of the map. I was able to choose a large square from Sydney in the East to Katoomba in the West and Woy Woy in the North to Wollongong in the South. 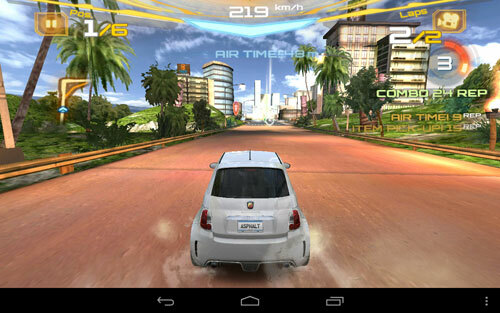 I’m not a huge gamer but I like racing games so I bought Asphalt 7:Heat for $0.99 and have quite enjoyed playing it. Holding the Nexus 7 sideways and using the accelerometer and gyroscope to play games is more fun than on my Android phone thanks to the Nexus 7’s larger screen and more powerful processor. If you’ve been holding out from buying an Android tablet because until now they’ve been too expensive and the touchscreen experience too stuttery then the Nexus 7 is definitely worth purchasing as a handy portable way of interacting with social media, reading an eBook, watching movies etc. “The Nexus 7 is a terrific little tablet. 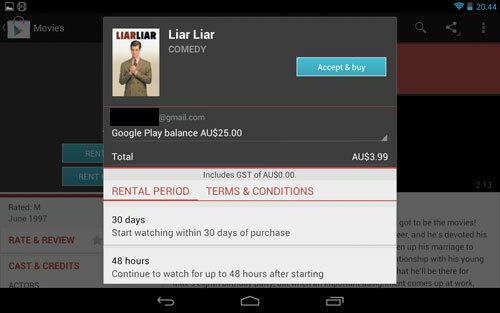 My only complaint is that it lacks any sort of HDMI connector for showing videos rented from the Google Play store, on your TV” – John Davidson, AFR. “It costs significantly less than the new iPad and aims to offer a compelling alternative at a budget price – a feat not yet accomplished by any other Android tablet manufacturer. The Google Nexus 7 isn’t perfect, but it’s one of the best non-iPad tablet devices we’ve ever reviewed.” – Ross Catanzariti, PC World. “If you’re looking for a tablet for games, media and books, the Nexus 7 is an outstanding device, sold at a great price. What it doesn’t have, you probably won’t miss.” – Joseph Hanlon, CNET. “If you’ve been holding off buying a tablet because of price, hardware or software concerns, take a serious look at the Nexus 7. Despite a few flaws (which are easily overlooked anyway), the Nexus 7 is a great tablet worthy of your time.” – Luke Hopewell, Gizmodo. The lack of HDMI becomes less of a concern when you realize the Tegra3 announced support for Miracast, which is a WiFi-Direct link between the tablet and compatible set top boxes or new displays. It may lack video output as of now, but I’m guessing with hardware support already there, its only a matter of time before Jellybean takes advantage of it. I have had my Nexus 7 for a week now, and I am regretting not waiting and spending the little extra money to get the Samsung Galaxy 7 instead. The utterly frustrating portrait-only orientation forced by Google makes for a horrible user experience, until I too discovered the Ultimate Rotation Control app, but resent having to pay extra for something that should be standard in the Android OS. The lack of extra storage and a rear camera, all of which are standard on the Galaxy – along with full screen rotation – make the Nexus less than appealing. EDITOR: I agree about the rotation control app but it was clear when you bought the Nexus 7 that there was no rear camera or extra storage, the Galaxy 7″ tablet is way more expensive so it can have more hardware features. I have both the Nexus 7 and iPad 3 and I personally still prefer to use my iPad. I agree with you GLEN, ! Today I went to the store and had the Samsung Galaxy and Goolgle Nexus 7 side by side. Last week I bought the Samsung and its only for me 39.99 more in price than the Nexus. Well I was thinking of returning the Samsung. It was very horrible that the apps work only in portrait mode. I played the same you tube video on the two tablets side by side. The Samsung has deeper richer awesome color and the audio on the Samsung was louder and sounded so much better. Also the Samsung has an HDMI out put. I know the Samsung has the 2nd camera. Im not sure if Ill need it but at least its there. Please tell me Im making the right choice and pass on a Google Nexus and keep the Samsung Galaxy? I would appreciate any feed back to my comments. Thanks! I know certain things are needed by certain users. However the Nexus 7 was not a surprise. When it was announced, the specifications were not hidden, but given straight out by Google. If a camera was a must for you, then the Nexus 7 obviously was not the tablet for you. As for being resentful for having to buy a $3 app… It’s no wonder developers can’t make as much money as android and iOS consumers think we’re poor. The only regret you should have is that you should have examined what you needed in a tablet and found out if the Nexus 7 could have provided it. There were no surprises here. I’m just surprised that someone that seems to to be very particular about how they spend their money, didn’t do their homework. I actually like Samsung and the galaxy tab 7. I own a Samsung phone and the galaxy player 5.0. Both of which will never get another OS update. If you don’t mind that and would rather trade in a quad core for a dual core. I say go for. I’m sure you can still return the Nexus for full price or sell it for just as much. I cannot see this latest Google attempt to radically shake up the Android market actually working medium or long term. Of course, their will be a knee jerk rush to buy whatever is released by a major company and hyped up as the best thing since sliced bread – But this Nexus 7 certainly is not. Why would anyone release (or why would anyone tech savvy buy) a new tablet without it being flash enabled, without it having HDMI, without it have expandable storage……. There are many other good quality tablets in the market place that do offer what the public really want, do some research and they WILL appear. more for the Nexus 7 that the price in the USA. So I will not be buying it. However I might get relatives in the USA to source me one if I decide to purchase one. I will definately not be paying the higher price here. Have had the Nexus 7 for a week now, and find it very easy to use and super-fast. I have never been an apple fan, and using an android tablet is so much easier if you have used an android phone such as the HTC one x. The lack of a rear camera is not such a big deal as the front camera is all that is needed for Skype, remembering it is not primarily used as a camera. Still finding my way around the Play store but it seems to have everything you need. Blogs like this one have pointed out things that are very useful. I would however be interested in hearing from anyone who has the HTC media centre paired with the Nexus 7. David, I would definitely recommend getting the Samsung Galaxy 7 instead of the Nexus. Even though I was able to install an app to force the Nexus to display Landscape when tilted (for $3) it is not quite the same as having that feature built in at the OS level. And I think for travelling the rear camera would be useful for apps like WORD LENS that can translate signs using augmented reality without a network connection. GLEN, Thanks for your feed back. I guess I’m just confused about the 2 tablets. It seems like the Samsung has so many features I dont know how to use it to take full advantage of it. My only 1 main thought was i use a service called oovoo for video chat for family members that dont have skype to use. on the samsung everyone I see is side ways. I called samsung support and they said if skype and tango another video chat i use is fine then it is not the samsung tablet. i thought if i try the google nexus 7 oovoo might work. but would it be a trade off to give up the other features the samsung tablet has that the nexus 7 doesnt have? thanks for your help! David, The Nexus 7 uses Andriod 4.1, and Skype has not been optimized for this version yet, and I find that the picture sometimes does not orient correctly, since the default position of the Nexus is not to allow you orient the device. So when I orient it to landscape my insert picture turns upside down, but apparently shows the right way up to the person I am calling. Skype should be optimized soon, but a lot of people have a gmail account and it’s simple to use google+ hangouts on the Nexus 7. If you have a gmail account, you simply have to sign into google+ on your device (computer, smartphone or tablet.) I’ve used it often with family. I do agree that Galaxy tab 2 7.0 3G has many features including support for flash, SD card slot etc but returned it after few days and ordered the Nexus tablet. The reasons for returning the Tab 2 are below average screen resolution (I know before I bought that it is not AMOLED but never thought that it will be bad enough that I had to zoom every page to read), 3G sim not sitting properly and overall build quality feel. After reading so many comments, I realise that Nexus has limitations but seems to have covered the basics well. I hope it works for me.